Artichoke has a long history of designing bespoke kitchens into large country houses in Gloucestershire and the Cotswolds. The Gloucestershire Manor house is in many ways the quintessential English house, and we count ourselves fortunate to have worked in many of the great houses around Stroud, Cirencester, Chipping Camden, Tetbury, Northleach and Painswick. Of particular note in many Gloucestershire houses is the fine stonework, much of which came from quarries in Chipping Camden in north Gloucestershire. The dry stone wall and stone tiled roof are particularly strong elements of the Cotswold building tradition, and designing into such buildings needs to be done with great care and attention. Artichoke has access to a huge database of period mouldings and period architectural joinery detail from many houses across Gloucestershire, and is currently working on a the bespoke kitchen, scullery and butler’s pantry for a Grade 1 listed Jacobean manor house near Stow on the Wold and a new build period country house near Bourton on the Water. We have also recently completed a significant bespoke kitchen project in Burford. 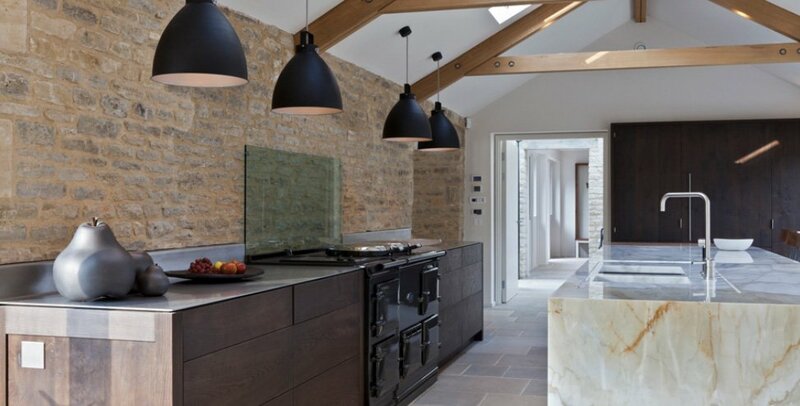 Artichoke recently completed a modern rustic kitchen design for a significant extension to a Cotswolds barn. The Aga and main run of kitchen furniture was designed against the old exterior wall of the house, and the worktop was fabricated from solid stainless steel and chased into the rubble wall with a dry joint. The faces of the furniture were made from oak which we heavily distressed and antiqued to introduce some texture to the facades. The marble used is from the Fontanelli quarry in Italy and is Calacatta Oro. Clients that commission Artichoke to design their kitchens in Gloucestershire do so on the understanding that we are going to take a much more detailed and analytical approach to their project than designers of high street kitchen ranges. Before we think about the style of the kitchen, we first look at the people using it, and how they function as individuals and families. 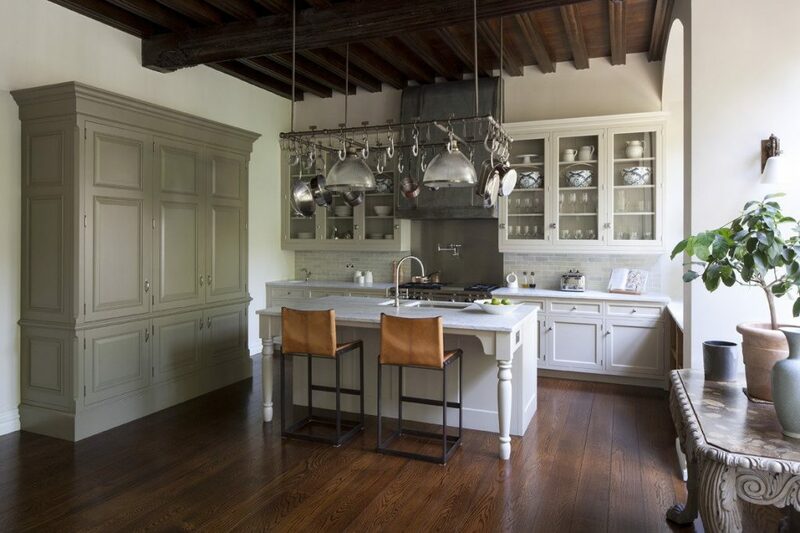 We are also not in to designing kitchens for the short term or a quick fix. Almost all of Artichoke’s clients are looking for a design company to do justice to their home, and to design and make a kitchen that will match the quality of their house and exceed their expectations from a both a cabinet making and quality perspective. We do what we do, in the way that we do it, because client’s put their trust in us with their homes. It is a responsibility that we take extremely seriously and it shapes the way everyone at Artichoke behaves. Clients in Gloucestershire can contact Andrew at Artichoke to discuss their project on 01934 745270. You can also view our portfolio to see more examples of our work in the area or email us at new newprojects@artichoke-ltd.com to discuss your project in greater detail.